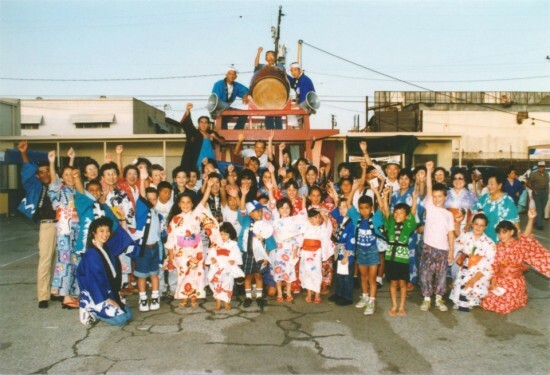 LONG BEACH — The Long Beach Japanese Cultural Center’s Summer Festival will be held on June 29 and 30 from 3-9 p.m. on Saturday and 3-8 p.m. on Sunday at 1766 Seabright Ave. in Long Beach. Food, games, an opportunity drawing, martial arts and flower arranging demonstrations, plant and rummage sales, ondo, plus outstanding entertainment from several groups will be featured. This annual fundraiser supports various activities and maintenance for the center. There will be ongoing showings in the classrooms of Carol Takahashi’s camp bird carvings, ikebana, shodo (calligraphy), Yukari Kai, sumi-e, Japanese Language School displays, and internment camp information. For information, call (562) 437-9924 or visit www.lbjcc.org. BLAST FROM THE PAST: Ondo dancers at LBJCC’s 1992 Summer Festival.